Gary Kent is a graduate of International Relations with French from the University of Sussex. After working as a trainee station manager for British Rail, an education secretary for the Co-Op, and a Lecturer in Harrogate, he began working at the House of Commons in 1987 where he has worked for several parliamentarians. He has been the Secretary of the APPG on the Kurdistan Region in Iraq since 2007 and has visited Kurdistan and Iraq 29 times. He is Deputy Chairman of the European Technology and Training Centre in Erbil and a regular columnist for Kurdistani media outlet Rudaw. I am a graduate of International Relations but my work on Kurdistan flows from having been a political researcher for various parliamentarians since the late 1980s. My connection with the evolving theory of International Relations is, therefore, fleeting. The most relevant issue here is the conflict between established sovereign states and lofty UN declarations of the right of peoples to self-determination, which I tackled in a recent article. 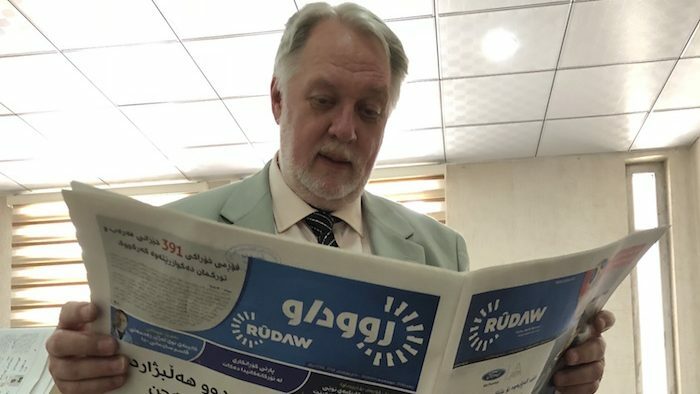 Another relevant issue is liberal interventionism, which has been discredited for many by the invasion of Iraq in 2003, as explained in my articles for Progress and Rudaw, followed by the tragedy of non-intervention in Syria which I have also examined. I supported the invasion of Iraq and note the disconnect between much of Western public opinion and – at least initially – that of most Iraqis and still nearly all Kurds, that the overthrow of Saddam was a liberation. John Major and Tony Blair are revered in Kurdistan as I have argued in relation to the Kurdistan no-fly zone and the perils of playing the western blame game. When I mention liberation, many look at me with bewilderment or contempt, although I also don’t hesitate to detail the many mistakes made during the occupation. They usually see the invasion based on deceit and use overblown rhetoric about Tony Blair, which is why I have been critical of the anti-war movement in articles for both Open Democracy and Progress. Iraq before 2003 also disappeared down the memory hole for many: both the debate about how to contain Saddam when the sanctions regime was failing and Saddam’s crimes. This is why it was so important to successfully persuade the Commons to officially recognise the Anfal genocide against the Kurds. I found out then how little many knew of what had been a cause celebre for older generations when I met a group of young Labour people and asked them what they knew about the Anfal genocide – one said he had not heard of Halabja but had heard of Fallujah. Those who said recognising the genocide and the chemical attack on Halabja was backward-looking in 2013 were soon wrong-footed by the use of chemical weapons in Syria and the following year by genocide against the Yezedis. The focus of my academic research in the late 1970s and early 1980s was the Soviet bloc and communism but the bottom dropped out of that particular market. From the late 1980s I was heavily involved for two decades with cross-party groups that opposed paramilitary violence in Northern Ireland and campaigned for policies that eventually became the essence of the Good Friday Agreement. This included work in Westminster for the integrated education movement, which seeks to encourage Catholic and Protestant pupils to attend the same schools and break the generational cycle of sectarianism in what is often described as the benign apartheid of Northern Ireland. I also supported the Northern Ireland trade unions which did so much to counter sectarianism and unite people on common issues of class rather than identity. All this became relevant when myself and others formed the Labour Friends of Iraq (LFIQ) group in 2004 to park honest differences on the invasion and unite to encourage support for the new trade union movement, women’s groups and the democratic process. Some of us helped write the Labour Party’s official position on Iraq in that year and activity with LFIQ took me to Kurdistan in 2006 to meet union leaders from across Iraq. As for influences, I would cite Fred Halliday, Christopher Hitchens, Donald Sassoon, Paul Bew, Henry Patterson, Anders Boserup, Mary Kaldor and Michael Walzer. But pride of place for me is a man few know, Kemal Shaker, the leader of the Kurdistani Communist Party who told me on that first visit in 2006, that union rights were important but the real problem was they didn’t have a bourgeoisie and could they borrow ours. This put us down the road to encouraging commercial and cultural connections with Kurdistan and my forming the APPG to do that in 2007. The remit of the APPG on the Kurdistan Region is to “promote friendship and understanding between the peoples and representatives of the Kurdistan Region in Iraq and the UK”. How does the APPG do this and what was its response to the 2017 Iraqi Kurdistan independence referendum? At the beginning of my engagement with the Iraqi Kurds, the most obvious obstacle was many had no idea where it was, literally. We helped put Kurdistan on the map by persuading Top Gear to film a programme in Kurdistan, which reached millions. In the last decade I have taken about 50 parliamentarians, some several times, and others to witness the ebbs and flows in the fortunes of the Kurdistan Region in Iraq, get to know key leaders and others, see for ourselves some of its beauty and hospitality (and international tourist potential), encourage deeper and wider links between Kurdistan and the UK, and report our periodic findings in parliamentary debates, and meetings with ministers and others. Our latest report by the delegation to Kurdistan was published in July 2018. We began our regular missions in the middle of what Kurds call the Golden Decade when federalism was generally working for the benefit of the Kurds and Arab Iraqis. Kurdistan saw itself as “the other Iraq” – self-confident with a brand new energy sector, a new economic entente with Turkey that replaced what seemed like imminent hostilities, and rising living standards. Its religious pluralism was another major positive aspect. Independence was a distant dream when large oil revenues were distributed to Kurdistan, albeit less than agreed. I saw a place with poor roads, few hotels or restaurants, overcrowded schools, few universities take off, but the condition of the people was clearly massively improved. However, we saw federalism fade between 2012 and 2014 when Kurdistani leaders also warned us of a new extremist group emerging in Mosul, which was to smash its way into control of Mosul and a third of Iraq in June 2014. An APPG delegation visited Kirkuk a fortnight after the fall of Mosul to meet its then Kurdistani Governor, Najmaldin Karim, who told us how the Peshmerga rapidly reinforced their positions and replaced the retreating Iraq Army. The Peshmerga saved Kirkuk. We then saw the traumatisation of Kurdistan and Iraq as a whole by the fascist death cult of Daesh and the Peshmerga became the world’s main frontline with Daesh. The scale of the political, economic, military and humanitarian challenges faced by Kurdistan from early 2014 was huge: they were deprived of their share of the federal budget by Baghdad, thousands of infrastructure developments were mothballed, they faced Daesh over a 650 mile border, repelled attacks with the help of vital Western airstrikes, and looked after up to two million internally displaced people, mainly Sunni Arabs, in addition to about 300,000 Syrian refugees who have been there since the start of the civil war there in 2011. We have visited many refugee and IDP camps and pay tribute to the generosity and efficiency of the Kurdish Regional Government (KRG). Other governments would have folded in the face of any one of these external shocks but the KRG got through this largely unscathed, although there were demonstrations and strikes about salary cuts, and some violence, and its parliament was effectively suspended for two years due to a long inability to find a consensus on the draft constitution. In Kirkuk we saw the Iraqi and Kurdistani armies initially failing to co-ordinate their efforts against Daesh in 2015. However, in Mosul before it was liberated in 2016 we saw new and historic co-operation between the Peshmerga and the Iraqi Army, which was initiated by Kurdistani leaders. We hoped that this military co-operation would make political rapprochement easier but it wasn’t to be although prospects for the referendum looked better in the run-up but the balance of forces changed. My evidence to two Foreign Affairs Select Committee inquiries on Kurdistan had some impact on their reports, which included breaking the historic taboo on Kurdish independence and MPs recognising that many Kurds feel imprisoned in Iraq. As for the referendum, the APPG agreed it supported the right to self-determination and that was reflected in various speeches in a major debate in the Commons. We didn’t advocate a yes vote, as that was a matter for the Kurds. However, the needless violence employed by Baghdad has done much to discredit its claim that Iraq is a voluntary union and for many strengthened the case for independence, even if that may be some time away. There is still a strong case for independence so Kurds in Iraq can defend themselves and take control of their destiny. The independence referendum included both the territory of the Kurdistan Region of Iraq as recognised in the constitution and other disputed territories in Northern Iraq. Did the inclusion of disputed territory have a significant impact on international responses to the referendum? The inclusion of the disputed territories represented a conundrum for the Kurds. Some feared that omitting them would signal that the Kurds were not serious about allowing the people of these lands to say if they wish to be part of the Kurdistan Region and would tacitly recognise the end of the process in Article 140 of the Iraqi constitution to finalise their status which should have been completed by 2007. Others thought that it was a red rag to a bull and it seems likely that the reaction of the neighbours was harsher than it would have been if they had been excluded from the vote. Retaking Kirkuk, in my judgement and that of Kurdistani leaders, would in any case have been on Baghdad’s agenda although KRG, joint control or Baghdad control are all permissible under the constitution. It was often overlooked that the reason the KRG was in control – and doing better in security terms – was that the Iraqi Army had deserted the province in June 2014 and the Peshmerga immediately reinforced their positions and saved it from Daesh. KRG control of Kirkuk was recognised in the agreements with Baghdad, the US and others on how to liberate Mosul. That violence was used to “retake” it and killed 100 Peshmerga cannot be forgotten and means that the Kurds will be insistent on implementing Article 140. As the US has said, the disputed territories remain disputed. The referendum in Iraqi Kurdistan was held just six days before the October Catalan independence referendum. Do you think this informed international reaction? My instinct is that this was a major factor in further inhibiting sympathy for what could be called secession in case it was seen as applying to Catalonia, although the two cases are quite different. It also dominated the coverage of western newspapers whose readers are more likely to have visited Barcelona than Erbil. This made it harder to expose Baghdad’s violence not just in Kirkuk but as its forces sought to breach the boundaries of the undisputed KRG. Catalonia coincidentally cloaked Kurdistan’s plight in the dark days and weeks following the referendum. Open conflict broke out between the Iraqi Government and the Kurdistan Regional Government in the aftermath of the referendum. What role, if any, could the international community play to prevent conflict escalating in future? The impetus for the referendum flowed from frustration that the agreed model of federalism was increasingly spurned by Baghdad, whose leaders had signed up to it in theory before the liberation of Iraq and it was enshrined in the constitution agreed across Iraq in the 2005 referendum. But acceptance was reluctant and federalism doesn’t fit easily with traditional Arab conceptions of the state and society. When I was last in Baghdad in May the Deputy Foreign Minister conceded that federalism was not well understood. My view is that the continuing failure to implement the constitution will mean the return of independence when the balance of forces is more favourable. Implementing federalism and building a reliable revenue-sharing law and acceptance by Baghdad of Kurdistan’s necessarily different and permissible regime on oil and gas will take the issue off the table for a much longer period. The mantra of many countries is supporting a strong KRG within a unified Iraq and the relationship should be based on the constitution. That could do much to discourage an escalation in violence between Baghdad and Erbil but antagonism to the Kurds is sadly deep-seated although it is a popular destination for many Iraqis, including MPs whose families live there to escape the sweltering heat of the Iraqi south. How was the referendum and its aftermath perceived by other minority groups in Iraq and will it have a significant impact on their own political aspirations? Given that Sunni extremism was exacerbated by sectarian centralisation in Baghdad which led many Sunnis to conclude that Baghdad was a bigger danger than Al Qaeda and then Daesh, there is a danger that attempts to reimpose centralisation from Baghdad will reinvigorate the remnants of Daesh, its ideology and even a new version of the organisation. The Sunnis are yet to settle back but they and the victims of Daesh will need decentralisation and protections in order to make their peace within Iraq and with each other. Resentment about centralisation in Baghdad has long simmered in Basra, which produces much of the oil and has little to show for it. Despite 93% of votes cast being in favour of independence, the Kurdish Regional Government offered to ‘freeze’ the result and Iraq’s Supreme Federal Court ruled that no province is allowed to secede. In what circumstances would you expect independence to be declared, if any? There was never any question that the 93% vote on a 72% turnout would have resulted in a unilateral declaration of independence. It was always intended to prompt negotiations on independence, perhaps some form of confederation or even guaranteed and reliable autonomy. The result may have been frozen but it will remain the clear and settled view of the Kurdistani people. You refer to the Federal Supreme Court but bear in mind that this has not even been set up according to the 2005 constitution. Massoud Barzani, President of Iraqi Kurdistan, stood down in November 2017. On balance, what do you think his legacy has been for the cause of Kurdish independence? It’s a bit old hat but it reminds me of Chou en Lai’s famous answer in the 1970s about the meaning of the French Revolution – that it was too early to say. I know that there is a consensus, received wisdom if you like, that the Kurds miscalculated and this has put them back for many years. I am not so sure. My reading of the situation is that the balance of forces changed fairly late in the day and that the chaos in American decision-making gifted an opportunity to Iran to make a decisive contribution to bolstering a harsh reaction by Iraqi Prime Minister Abadi (with whom I once briefly worked). This broke several key parts of the constitution in an opportunist effort to play strongman politics in the run-up to the Iraqi elections in May and even involved a direct attempt to invade the recognised Kurdistan Region, and dismantle its government. This failed and relations are returning to normal. Kurdistani divisions and fault lines were exposed, for sure, and particularly the lack of central command over a unified Peshmerga. Yet the Kurds have made it plain that they wish to leave Iraq but have the weight to be a force while they stay. The world was wary of the effort to leave but Kurdistan retains its special place in international relations – not quite a mere sub-sovereign state and not quite a nation but an entity that is treated as a near-nation. Opposition to the referendum pivoted on the timing and the need for negotiations with Baghdad but most countries were not opposed in principle to self-determination. I have no idea whether or when that can become a practical option and much depends on the willingness, with international support, to vigorously reform their economy and politics. Our latest fact-finding report details what is wrong with the badly balanced economy and the need for diversification and a bigger, independent private sector. The need for that has been made clear and Western countries are keen to build a strong KRG in Iraq, including by helping train its MPs as better and more efficient public representatives. We are very pleased that when we met the Secretary of Parliament and colleagues from various parties that they offered to set up their first APPG – and one focusing on the UK, a great tribute to Anglo/Kurdistani relations. If making Kurdistan match-fit for any possible future is the outcome of the referendum then the legacy, for President Barzani and others, will come to be seen as a huge advance, with the referendum being seen as a stepping stone rather than a cul-de-sac. The jury is out and I look forward to IR scholars and others examining what happened before and after the referendum. What is the most important advice you could give to young scholars of International Relations or those interested in the work of APPGs? I should have worked harder for my degree but allowed myself to become consumed by student and local politics instead although I have tried to make up for it by writing regular columns over the last 20 years as an amateur postgraduate degree. My two major engagements with Ireland and Kurdistan over the last thirty years both came about more by accident than design. APPGs are many and varied but there is no established career path. I haven’t finished but if I have to draw a lesson it is this: political engagement, often on the left, is prone to inertia and can lead to dogmatically defining orthodoxies and denouncing traitors. Open-mindedness while sticking to your guns, so to speak, is necessary, as I have written in The Independent. This enables activists and academics to defy the often quoted lines from WB Yeats about the best lacking all conviction, and the worst being full of passionate intensity. Principles, pragmatism, and moderation in method and argument can coexist, in 280 or more characters.